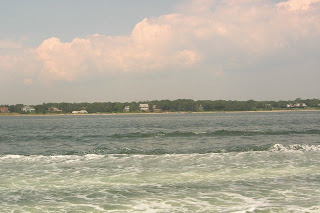 The East End's North and South Forks are gaining focus not only on saving farms so we can have delicious fruits and vegetables but local authorities, including the Trustees of the Town of Southampton, and local citizens are doing their part in helping to revive the shellfish industry with shellfish hatcheries. Once the baby clams are big enough, "the size of a head of a pin" explains Michael Wright of Southampton Press, they are released into the "wild" to grow into mature scallops, oysters and clams, soft shell, cherry stones, steamers, and my favorites, little necks. Our neighbors, the Shinnecock Indian Nation, are reportedly running a hatchery a mile down the coast from our bayfront home on the east end of Shinnecock Bay. The well-protected tributary of the bay, Heady Creek, just east side of the reservation, provides an ideal nursery for the tribes 250,000 oysters. 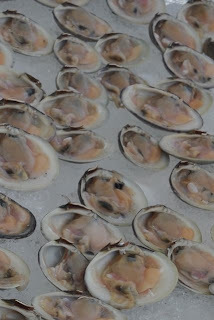 For more posts on the local shellfish industry, check out Lighthearted Locavore (7/26, 12/10/08). Read more in today's Southampton Press. "Ever since a vast indigenous, wild population of shellfish in East End waters plummeted due to pollution, loss of habitat and destructive natural forces, local municipalities and longtime shellfish harvesters have been searching for ways to offset the crushing financial losses that accompanied the near collapse of the local shellfishing industry. MORE "